Each piece is 1-1/2" x 3-5/8" x 1/4". 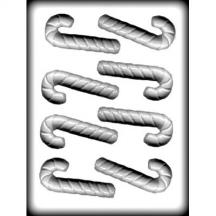 8 Cavities per candy cane mold. The molds arrived quickly and they look perfect. and I can't wait to try them.